New Promotor again this season as Jim Dubois the current owner of the Onaway Speedway will assume the president position of the Sault Area Racing Association. Car counts have been horrible the last 2 season with barely reaching out of the teens in 5 classes and fans counts not even close to 100 on some nights. the track has a web site still but is not kept on to well. its www. kinrossspeedpark. com. I served as a tech director up there in 2008 when Gerry Liscumb Jr had control of the track. I have also raced there a few times in the pure stock class. Race nights were Friday nights Current classes that were at the track in 2011 were Open Late models (Template/Outlaw/Limited), Modifieds (USA/ Laird Rules), Factory Stocks, Pure Stocks and 4 Cylinders. there were also special events like lawn mower races there also. There is also a kart club that runs at the track on seperate race nights. Historical note:The track opened in 1995. 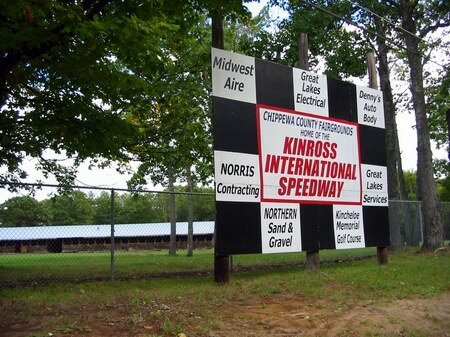 It has also operated as Kinross International Speedway and Kinross Speedway. The dragstrip operated in the 1980s on the nearby runways under the name Kinross Dragstrip. When I was little I went to this track for many snowmobile races with my parents who own The Winning Edge magazine, for awhile races were not held their until they managed to get the track back for racing this year, was pretty amazing and my dad was excited to be back in the infield again taking pics for the magazine and doing interviews, mainly his love was the racing. I now follow him to all the races. 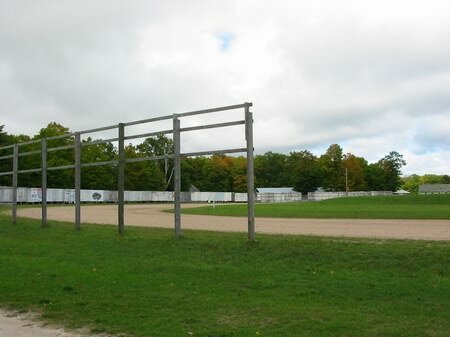 The planning and building of the Kinross Speedway started in the early 90s with the idea that the Eastern U. P. as well as the Canadian Sault and surrounding area was ready to support stock car racing. It was simply a matter of moving this process from the planning stage to the building process. Thus was the birth of New Era Motorsports. New Era Motorsports was a limited liability corporation comprised of several local businessmen and was organized specifically to operate the Kinross Speedway. This group operated the Speedway up-to and including the 1999 race season. 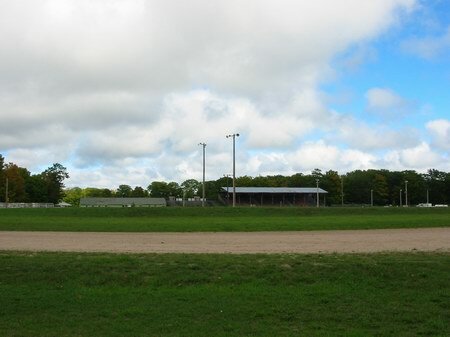 That would mark their final season as promoters of the facility as the Kinross Charter Township opted to operate the facility the following year. It was in 2000, that the Township appointed local businessman Wayne Donaway to run the day-to-day operations of the track as part of a 1-year contract he agreed to. 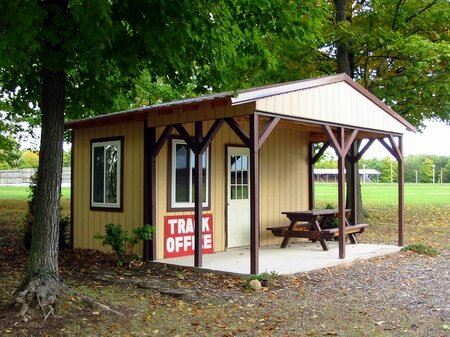 One year is all that this arrangement lasted as now the Township had determined that they would Lease out the property but would not be involved in the day-to-day and financial aspects of the track. With that decision in mind, the Township put out a request for proposals for the 2001 race season. Approximately 3 groups of individuals submitted interest to the township and in the end RWR Racing Enterprise, consisting of Dan Remillard and Walter Verdecchia received the nod. Their tenure as operators of this 1/4 mile facility lasted through the 2001 and 2002 seasons before once again the Township requested proposals to operate the facility for our upcoming 2003 race season. After a very long process that would see many meetings and calls, the reigns of the Kinross Speedway would be handed over once again. Monday, February 17th, 2003 would mark the day that the 4th set of promoters would be introduced to the Kinross Speedway. Todd and Donna Nyberg go into this season as the newest group looking to make this facility one of the best in the state. With a switch in racedays along with other changes in staff, rules and the facility in general - they hope they can achieve that goal over the next few years. Now back to the track. The track is 1550 feet in length and was built during the summer of 1995. It was completed during the Chippewa County Fair, a matter of hours before the first race was scheduled. The funding was a joint effort by the Kinross Township Board and previous promoters New Era Motorsports. The facility was constructed by and under the guidance of the owners of New Era Motorsports. They also received much appreciated help from several local residents that donated a considerable amount of time throughout the building process. The pacing was done by Smith Paving of Marquette in which a concave racing surface was built. This incorporated a unique racing surface which consists of 3 degrees of slope on the inside increasing to about 12 degrees of slope on the outside of the corners. This allows for higher speeds on the upper racing lanes allowing for more even competition regardless of how wide the racer takes the corner. This explains the reason for some racers actually preferring the middle portion of the track depending on exactly how their car is set up and handling. 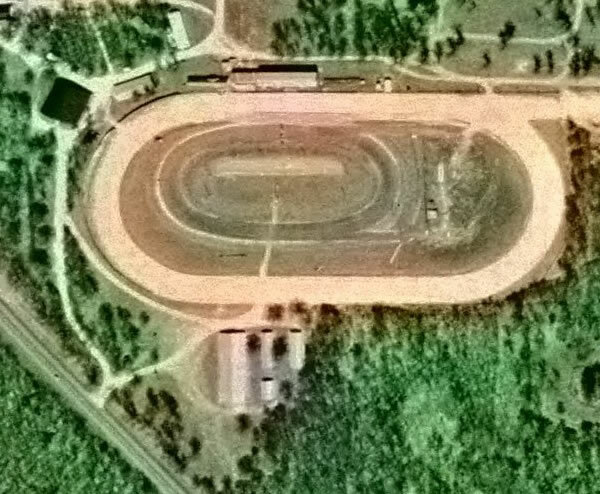 Because of its unique design several of the racers have indicated that the Kinross Speedway is the best short track on which they have ever raced. Super Late Model cars have been clocked at speeds in excess of 100 MPH on the straightaways.